de Souza e Silva, A. (2011). Location-aware interfaces in hybrid spaces: Locational privacy, control, and urban sociability. Transforming Audiences 3: Online & Mobile Media, everyday creativity, and DYI culture. University of Westminster. London, UK: September 1-2 [via Skype]. de Souza e Silva, A. (2011). 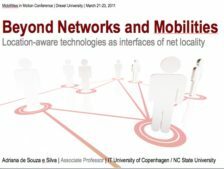 Location-aware technologies as interfaces of hybrid spaces: Beyond networks and mobilities. 2nd International Conference of the Pan-American Mobilities Network and the Cosmobilities Network: Mobilities in Motion–New Approaches to Emergent and Future Mobilities. Center for Mobilities Research and Policy at Drexel University. Philadelphia, PA: March 21-23.